Glitch Wizard creates animated or still images based on a series of pre-set "glitches" you can apply to your photos. You've possibly seen "glitch art" popping up around the web lately, with flickering GIFs of colorful digital weirdness warping ordinary photos. While they may be a passing fad like the Harlem Shake, they require a bit of work to create in a program like Photoshop. 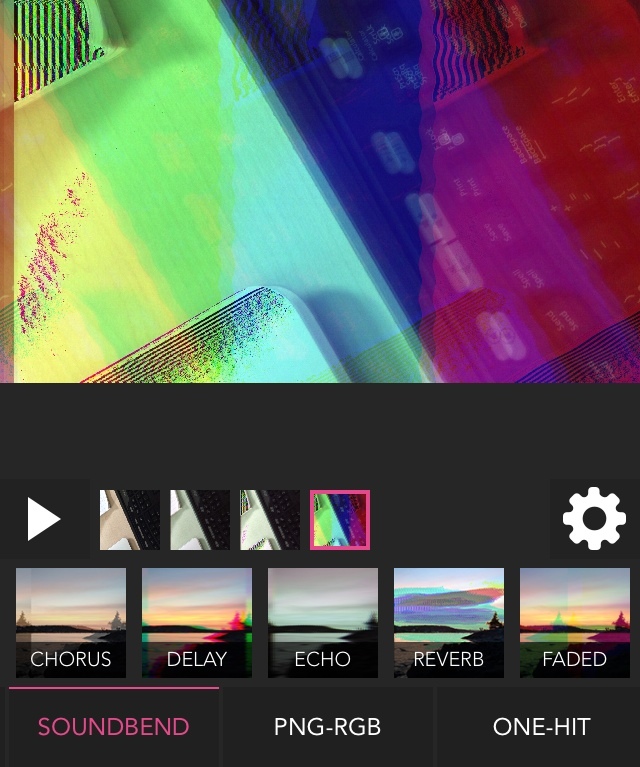 Enter Glitch Wizard, which is a simple but polished app that takes your photos and adds glitches and allows some basic animation of those glitches as you sequence the effects you add to the photos. The app is nicely designed with three icons at the bottom on launch: the standard camera icon at the bottom of the screen to either take a picture or use one from your photos. The app opens with a list of featured glitch artwork, which I assume is curated by the folks who make the app. You can get to these later by tapping the star icon. I found this interesting on first launch as a sort of example of what the app can do, but ignored it later. Then there's a grid of the glitches you've saved when you tap the grid of squares icon. To create glitches, grab a photo and you're taken to a composition interface, with an area showing each glitch, a playback button, settings and a series of effects each categorized into four groups. I won't go into each group of effects, as part of the fun of Glitch Wizard is seeing what each one does (and it can be wildly different depending on the image you start with). Suffice it to say there are a lot of options for making truly wild images and animations. Some effects allow you to tweak them, but most are simply applied and can be a bit random, as is the nature of glitch art. Also, you can keep adding effects to further glitch your images. The progression is often really fun to see animated. What I enjoyed was playing around with the effects, then seeing how progressing them would make an animation smoother or weirder. In all, it's just a lot of fun. While I'd like more editing options I realize there's little here I couldn't do in Photoshop with filters. But that's not the point -- this is designed to be quick and fun. You can delete individual frames, but I couldn't find a way to re-order them. You can also change the speed from slow to medium to fast, and set the animation to ping-pong back and forth or just loop. Once you're done you have a variety of sharing options, which I found interesting in their end results. On Twitter, for example, you can post a "native GIF" aka a GIF that Twitter has tuned for consumption on Twitter (and is no longer really a GIF). Although Twitter supports animated GIFs, I found it was easier to share them via this app than pulling them from my camera roll because Glitch Wizard doesn't actually save GIFs to your camera roll. Moving on, Instagram and Facebook posts are converted to videos. The thing about glitches and web video, however, is that compression relies upon sameness from frame to frame (generally speaking). My glitches looked really fuzzy if they were really wacky glitchy GIFs to start with. This isn't Glitch Wizard's fault, and frankly I appreciate the fact that it creates a video versus posting some lame link to a page that will inevitably break years later. Kudos on the sharing options for Glitch Wizard, as it's one of the best models I've ever seen in an app. Too bad Facebook compresses them so horribly. I found Instagram posts to have fewer artifacts and hence more clarity. Yes, you can save your creations to your camera roll, among other options (like tumblr, although one of my GIFs didn't post as animated when I tested it, so this could be a buggy area). My only complaint here is it's too easy to lose your creation. If you don't save to your glitches in the app or to your camera roll, however, your creations are lost forever. Also, it's a little odd that the app doesn't actually save a GIF to your camera roll, but rather an .m4v file. If you pull this onto your Mac you'll have to use another application to convert to GIF. If you want the GIF itself, the only option is to email it to yourself. Glitch Wizard is a simple but fun app that creates crazy glitched artwork from your photos. That's really all there is to it, although it's wrapped up in a great design and works very well. It's currently on sale but I'd recommend it at the full US$1.99 if you enjoy making glitch art.